Battlecry: Reveal a minion in each deck. If yours costs more, gain Charge. Yep. It's a horse... wearing armor... going to war. More winning conditions for Druid, me like it. It will be a lovely add-in to my beast synergy control hunter. Because "if yours cost more" is clear enough to understand that you only get the buff "if yours cost more". If they cost the same... yours won't cost more, so it won't get the buff. WHY ARE YOU AN IDIOT. That's why when you're facing aggro decks (90% of the time), use this and thou shalt be rewarded valiantly. The art and the concept together make this one of my favorite cards. An aggro card that doesn't work in aggro decks. eeeh i don't know. You're gambling to either get a slightly better kor'kron elite or an awful minion. Sadly I think Piloted Shredder >>> This. You playing a card game itself is a gamling, lol. From the moment you draw a card, that is a gambling. This compare mechanic is cool, I like it more than inspire but I will have to test both to really know. 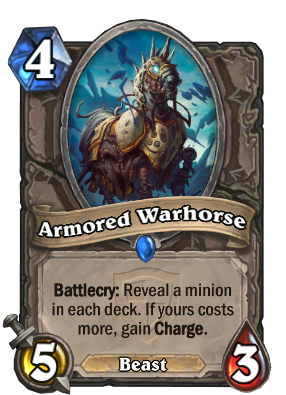 This card seems so OP, 4 mana 5/3 with charge? Come on. Comparing is definitely cool as others have mentioned that you will be able to guess what deck is your opponent running. But realistically, you WILL be able to tell his deck type from the way he play and the cards he played on earlier turns T4 and below. So, the goal to "know your opponent's deck" is just a dream. I mean come on, a Warlock that uses 2 Hero Power consecutively can be a Zoolock ?? Even if he's bluffing, he has lost ALOT of momentum (in which nobody stupid enough to do that). From the way I see it, the key goal from this effect is to see [b]what card has not yet been pulled[/b] into the opponent's hand AND to reveal special cards that are not usually in the deck, specifically, tech cards (Kezan, BGH (but this one almost certainly), Ooze, Harrison, etc). This is the true goal that can be achieved. I agree, even if you see half of the deck you may not which deck it is, but if it is one of the common decks then you will be able to tell before turn 4, so this one revealed card doesn't change too much. Still those cards are rather strong, and from what I tried in deck builder it seems that it is possible to build good looking deck without even one minion that costs lest than 4 mana with average minion cost over 6 mana. Even handlock has average minion cost around 4-5 mana. Don't rate the card much, but man, I really like the artwork. Awesome card. I'm so glad to see a counter to the agro deck epidemic. First it was zoo locks, then face hunters, now aggro pallies. I like slow games where every turn matters and I see it happening. The probability against Control to win the Joust is too low.